Thousands of Dota 2 players from all over the world expressed their disappointment on social media when Valve did not release a Dota 2 Halloween themed event for the year 2013. People started sending tweets and posting the Give Diretide meme on Volvo's social networking accounts. 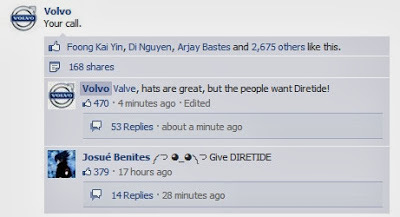 Volvo: Valve, hats are great, but the people want Diretide! 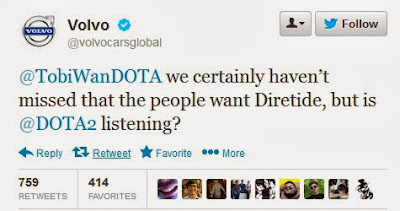 Volvo asking if Dota 2's developers were listening. Upvoted to the front page! ༼ つ ◕_◕ ༽つ Give DIRETIDE. Commend Volvo.